I am so excited to be one of the stops on The Hero's Guide to Being an Outlaw blog tour. I hosted a stop on the Hero's Guide tour last year for book two, The Hero's Guide to Storming the Castle, and I also reviewed the audiobook of the first book, The Hero's Guide to Saving Your Kingdom. Needless to say, I am a huge fan of this trilogy and am sad that Christopher Healy is stopping at three books. I wish this series would go on and on. I love fractured fairy tales (I'm a fan of subversion, what can I say?) and the nonsensical humor Healy has exhibited in our four buffonish heroes. Christopher Healy is the author of the Hero's Guide trilogy: The Hero's Guide to Saving Your Kingdom, The Hero's Guide to Storming the Castle, and coming in spring 2014, The Hero's Guide to Being an Outlaw. The series is a comedic adventure that follows the exploits of four different Princes Charming in the aftermath of their not-quite-accurate fairy-tale fame. It was first published on May 1st, 2012 by Walden Pond Press, an imprint of HarperCollins. A film version is currently in development at Fox Animation/Blue Sky Studios. 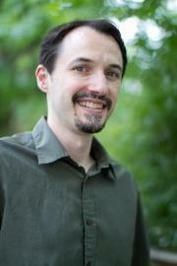 Chris lives in New Jersey with his wife, two children, and a dog named Duncan. Visit him at ChristopherHealy.com. And learn more about the Hero's Guide universe at OfficialHerosGuide.com. Little Known Fact: At fourteen, Euphustus Bailywimple was the youngest person to ever graduate the Avondellian military academy. He won his first honor from the king at the age of eighteen, earned his captainship by twenty, and by twenty-five was considered to have the most accomplished hair in all of Avondell. 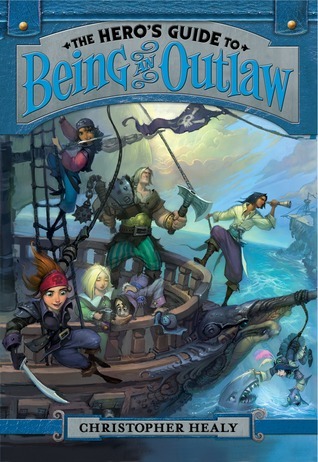 One winner will receive a signed finished copy of The Hero's Guide to Being an Outlaw by Christopher Healy! Thanks to Walden Pond Press for sponsoring this giveaway.